In A Relationship: The UX Designer's Role in Understanding Context | Hey Design Thinker! Early 2018, I had the chance to travel outside of Canada and meet UX practitioners from my homeland. I was planning to give this lightning talk (which is a love letter to UX and those starting in the field); but decided to scrap it and just run with what the UX meetup organizer had in mind (it was so much better). Here’s that undelivered talk and why I think UX designers are relationship builders par excellence. One of the hallmarks of the traveler’s experience is public transit. We need to know how to get around town so we could enjoy the place’s sights, etc. 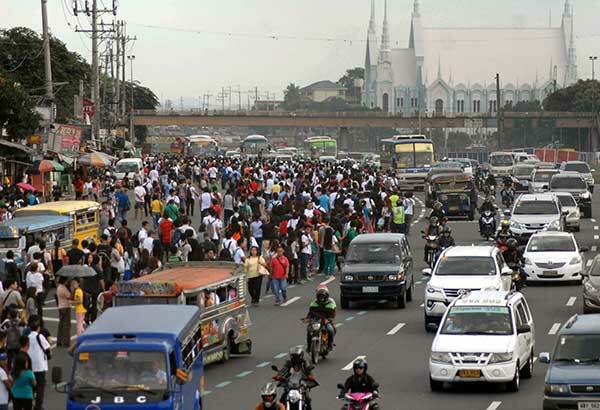 Some people even consider the transit experience an adventure in itself – just look up “public transit in Manila” on travel blogs and forums and you won’t have a shortage of thoughts on how ‘action-packed’ commuting in Manila can really be. As a former resident, you’d normally think that I still have it, that is, medyo gamay ko pa ang magpaikut-ikot sa siyudad (I still know my ins and outs in the city). Turns out that seven years later, the transit maze just got bigger. Not only do I have to deal with the usual suspects (e.g. buses and jeepneys) but now there’s UV Express, taxis, and Uber and Grab, on top of the almighty Manila traffic. All this leads to a testy transit experience in Manila. Kung gusto mo talagang makarating sa destinasyon mo nang nasa oras at fresh na fresh pa rin, good luck sa iyo (If you ever want to get to your destination on time and very fresh, good luck to you). You’ll need all the planning in the world and all the information needed to get from point A to point B. Now, if you’re lucky, you’d be able to ask someone. But if you try to listen to these transit instructions – like, take this bus to Ayala, then get on a jeep going to X, then hop on another jeep then lakarin mo na lang (just walk) to your destination – you gotta admit it can be quite confusing. Swerte mo (You’re lucky) if you have a data plan and can pull up Google Maps or get an Uber cab at the drop of a hat. But not everyone can do that especially for us who are on Airplane mode. And think about those who aren’t using smartphones or those with no tech access at all. Such frustrations are the starting point for human-centered design thinking. And we UX practitioners are in a perfect position to fix these things using tools and methods unique to the design profession. The title of my sharing is “In a Relationship”. This isn’t just some #hugot moment where I tell you my romantic woes and tell you how #sawi (lovelorn) I am. Rather, it is my strongest belief about who and what we are as UX practitioners: that we are relationship-builders throughout the design process starting from the people you design for all the way to the people who give you your paycheck. This mindset permeates every single aspect of the UX design process and it’s a proven way to make things a little bit better – if not completely better – for the people you are designing for. So what does it mean for the UX Designer to be “in a relationship” with his/her users? For me, it is about understanding context. It is that deep, situational look at your users’ lives, asking “what is going on in the lives of the people we’re designing for” and finding the unique pain point that’s worth solving. Let’s look back at the time you fell for someone: Did you get satisfied with simply the base details like name, age, course, job, home address, and – if you’re lucky – their number and relationship status? You wanted to know more and you want to make them fall for you. Hard. We also do that in the design process – we begin with the problem and ask ourselves and our users, “tell me where it hurts” and WHY. This WHY question permeates the entirety of the design process. It’s the question that probes and asks for reasons – reasons that reveal your users’ motivations and intentions towards the problem they want to solve. It shows you what truly matters to the people you’re designing for and what would make their lives a little bit better with whatever it is you’re building for them. So if there is anything I want you to take away from this lightning talk is that we shouldn’t be afraid to ask why, to dig deeper, and look a little further. But we seldom ask why – “Why do they go through the trouble of working through this product that, for better or for worse, is good/bad/whatever you call it?” – which could very well tell you what matters to your users and what their vision of what a good product or service could be. It is the discovery of insights and opportunities that makes our design jobs the adventure that it is. Just ask Doug Dietz who redesigned the dreadful pediatric CT scan room into an exciting “Pirate Adventure” or the folks behind Sakay.ph who want to help you navigate the city a little bit better. These moments of discovery and success make our work truly worthwhile and they wouldn’t happen without that close relationship with the people they’re designing for. So how do we build that user-centered (product/design) relationship? The first step is to ask “why?” This, to me, is the catch-all term for UX research. It is about the user’s journey and the path they take to solve their biggest challenges. It starts with knowing who they are (through user interviews and personas), understanding their situation and current journey (through journey mapping and scenario thinking), finding their job-to-be-done (through job stories), and then designing your product/service offering from those insights. New software products have an equally crucial market discovery process in place. You establish problem-solution fit (a.k.a. “Is this problem we’re having really worth fixing and solving?”), determine whether there is market potential through customer research (e.g. personas, problem and solution interviews, etc. ), and then prototype a solution that responds to the customer problem you’re looking to solve. The point of these processes isn’t to delay the creation of the product but to deliver something suited to your users’ needs. Now, speed is great. Nobody wants a bottleneck. But what if in the pursuit of speed, you ended up building the wrong thing? I mean, you don’t want to be trapped in analysis paralysis. But that doesn’t mean you give up on analysis just because it seems tedious and, in some cases, boring. The solution, I suspect, is through a leaner discovery process that doesn’t hold up the project team. But that’s a topic for another day. Ultimately, people buy products or services that gets their job done. And they will gladly switch to something that they know solves their problems faster than they normally do. This is the reason why Uber and Grab have been serious options for the everyday commuter. Sure, it can be a highway robbery during the worst of times (a.k.a. surge pricing), but you got to admit that it simplifies the traditionally arduous task of flagging down cabs that may or may not even want to take you to your destination. It’s the reason why Airbnb is an emerging rival to the Hotel Industry as we know it, not just because of its well-designed user interface but its promise of staying at a place that’s like your home, without the price of a fancy hotel. If there’s one thing common among these Silicon Valley startups is that they knew from the get go that it’s all about the human. They solve inefficiencies in daily life by inquiring at the pressing need the target user has. And it’s something that’s made possible through UX research and building that relationship with the people they’re designing for. To end, Genuine interest + good intentions = a stellar user-designer relationship. Just as how you try to get to know the person you want to be with, you try to understand your users’ lives and context in order to build products that fit their needs. Doing so involves asking what matters to the people you’re designing for and building products and services according to what they need. This ensures that what we put out into the world is not just another app, website, or thing, but a product that fits well in your user’s lives. For our job as designers isn’t to come up with more of the same, but something that captures people’s lives with what we make. Previous PostPrevious What If You Didn’t Have to Fail? What If You Didn’t Have to Fail? Jem is a User Experience Specialist who builds insightful, creative, and usable digital experiences. Hey Design Thinker! represents his best thinking on UX and everything else beyond the glowing screen.